Happiness Project Recipe #63: Fathers Day Fun Bowls! Fathers Day Year 3! Fathers Day this year within my little Family of 3 wasn’t quite what I had hoped it to be. I had PLANS for the Father of my beautiful Little Girl. But we all know that life sometimes happens when you’re out making plans. With no exception this year. That grandeos plan of creating this lovely toddler painted hand print, decked out in a cute homemade photo frame? Nope. Instead of cute toddler prints with glitter and glue, the middle of this week consisted of emergency back surgery (for me). Which meant rest. And very little (nearly non-exsistent) physical activity. Which meant NO kitchen time. None. Imagine, just imagine, how depressing this is. Could you keep yourself away from your own kitchen for 6 to 8 weeks?? Yes, 6 to EIGHT weeks. See? Depressing. So needless to say, nothing that I had wanted to create for my beloved Husband happened. HOWEVER. You want to know what DID transpire instead? A dessert recipe incorporating two of my Husband’s favorite things: vanilla ice cream and waffles! 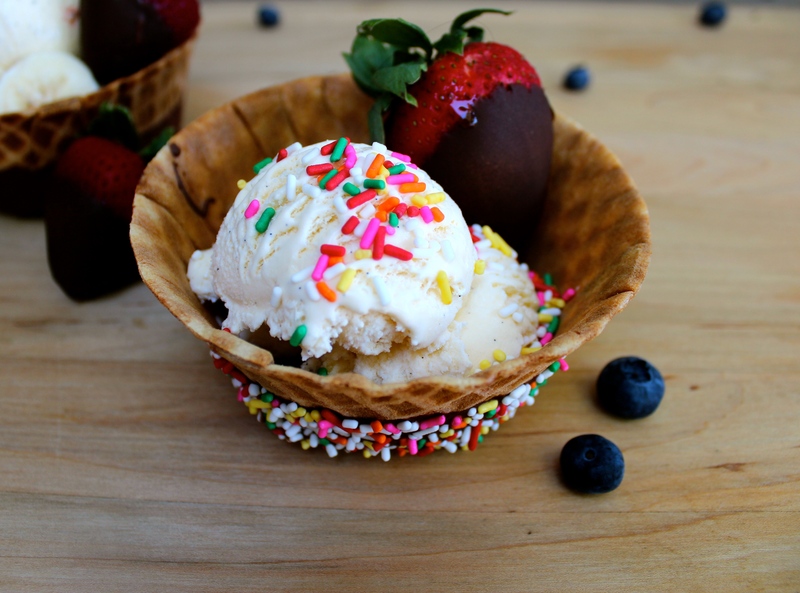 A chocolate dipped waffle bowl that required NO oven time! Which, in turn, required very little physical activity on my part. Doctor approved. And since no Fathers Day treat would be complete without something special just for his Little Girl as well, I threw (literally threw) in a whole lot of rainbow sprinkles. Which (naturally) ended up everywhere but on the actual waffle bowl. Chloe Girl approved. So who’s ready for one of the simplest and cheeriest of no-bake desserts? Husband approved. *If you’re eagerly wanting to whip up some home-made ice cream beforehand, here’s one of my favorite (& easiest) go to vanilla ice cream recipes. Firstly, line up all of your ingredients for easy assembly. 4 waffle bowls, 1 bowl of strawberries, 1 bowl of cut bananas, 1 bowl of blueberries. In a large bowl, heat up the candy melts, stirring in 20 second intervals until completely melted and smooth. Remove from the microwave. Place the 4 waffle bowls on parchment paper and then, one at a time, dip the bottom half of each bowl into the bowl of melted chocolate. Deposit each bowl, upside down, onto the parchment paper to dry. *If you want to add sprinkles to the waffle bowls, hold each bowl up by the rim, one at a time, and sprinkle on however many jimmies you want, until the chocolate is fully covered. Next up? The strawberries! While pinching the head of each strawberry, dip each tip into the chocolate, one at a time. Let each strawberry sit on it’s side to dry. Once the chocolate on each waffle bowl has hardened up and dried, grab up that yummy carton of vanilla ice cream and load those bowls up! Followed with a generous heaping of those chocolate dipped strawberries, banana slices and juicy blueberries. And maybe, just maybe, another pinch of sprinkles. More so for that eagerly awaiting toddler, than anyone else. « The Children’s Book Worm! Interview: Mandi Pimental! I am so sorry to hear about your back surgery! I hope your recovery is quick and easy. I would die if someone said i couldn’t go into my kitchen! 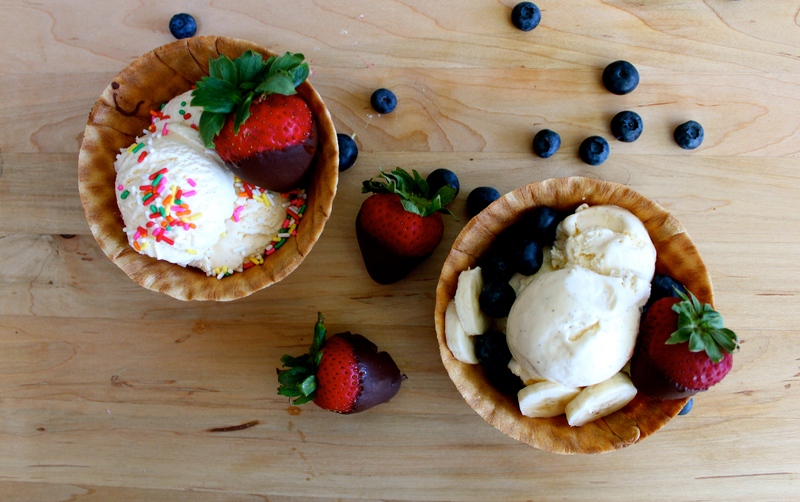 But these super kid friendly waffle bowls are perfect for any fun occasion! Thanks for sharing. These are perfect and look so delish! I hope you’re starting to feel better. These look so fun, I have a ton of white candy melts left over from my little one’s birthday party so this will be a fun summer activity for us to try! These look like everyday fun bowls! I hope you get better soon.